Digging back into your family history used to mean journeying to dusty records offices, scanning microfiches, and trudging round brambly graveyards. That can be fun but time consuming, which is one reason genealogy is presumed an activity reserved for old folk with retirement time on their hands. For those of us with less time to spare, the rise of online genealogical resources makes researching our family history not just easier but possible in the first place. There are several impressive online genealogical services, and the most popular family history site is Ancestry.com, a subscription service that costs $159 per year for U.S. only access, or $299 a year for the full Worldwide service. Ancestry’s online resources stretch past 4 billion searchable records from historical censuses and parish records, to military records and passenger lists. Starting an Ancestry family tree is simple, and the interface is both simple and quickly expandable in depth. The only drawback with such a cloud-based service is that you need to be online to access your tree, although there are free, quality companion apps for iPhone and iPad. So even though Ancestry fulfils your researching and recording requirements, there remains a need for an offline resource. There are several family history applications for Mac. Mac Family Tree ($60; Mac App Store link) is great for the basics, and easy to learn. Reunion ($99) is the more established, more complex Mac family tree program. Both are great options but suffer somewhat from un-Mac-like interfaces and require digging through several levels of information to get what you’re looking for. What I’ve been looking for is an offline family history application that matches Ancestry.com for simplicity of design and function. So the fact that Ancestry offers its own program Family Tree Maker (Mac App Store link), is an obvious draw. On Windows, Family Tree Maker is one of the most popular genealogical software programs on the market. The release of a Mac version is therefore both welcome and exciting. That Family Tree Maker for Mac is closely integrated with Ancestry.com makes it an obvious choice both for people already using the online service, and for anyone who would like to try out the online service. This is because Family Tree Maker for Mac comes with a free six-month Premium Membership to Ancestry.com. It doesn’t include the features of the Worldwide subscription, which offers a few billion more international records to trawl, but it’s enough to get going on for U.S. records. Getting started is easy. You can start from scratch, adding names, dates, locations, etc. You can also import data from existing trees using the standard GEDCOM format, or import one from Ancestry.com. Then you’re ready to begin adding data or media, and searching online resources. Family Tree Maker for Mac has a neat, logical and easy-to-navigate interface. At the top of the screen are seven buttons: Plan, People, Places, Media, Sources, Publish and Web Search. The People section, divided into two tabs (Family and Person), is your principal area for input and research. The Family tab shows a cut-down version of the Ancestry.com family tree view, including the green leaf icons indicating Hints from Ancestry.com that might point to data in its records that can be linked to that person. Regularly updated hints (including census records, birth, marriage, and death records, court and land records, immigration and military records, and other users’ family trees) are a great Ancestry.com feature, and its inclusion in Family Tree Maker is a big bonus—only if you remain subscribed to its service, of course. Otherwise it will just be frustrating. Where Family Tree Maker beats Ancestry.com is the amount of information around the tree, showing not just the person selected but his or her parents, spouse and parents, marriage details, and children. The Person tab breaks out Facts, Timeline and Relationships. The Facts tab displays Event details and the ability to add notes, as well as showing main sources. Maps are an essential tool in genealogical research. They allow you to make connections where multiple instances of a name can confuse, and bring geographical context to your ancestors’ lives. Family Tree Maker maps each location in your tree, so you don’t have to jump to your web browser to scan online maps for clues—it’s a great feature. 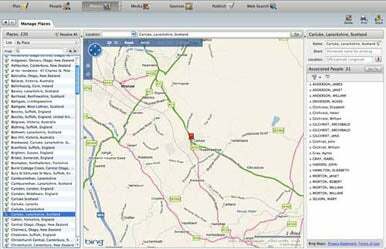 It uses Bing maps, which include standard 2D road views and satellite aerial views. There’s an option for 3D views, but sadly this isn’t yet supported on the Mac. The Media tab shows you all your photos and document scans—easily editable, and available to add to other people in your tree. This part is actually easier than on Ancestry.com itself, and is a real spur to keep adding photos and other media to your tree. In the Publish section you can create charts and books of your family tree, as well as reports on people, places and relationships, for example. Books can be created within the program, then put together professionally in conjunction with mycanvas. I found the charts accurate but rather basic with rather amateur backgrounds available. Mac Family Tree has more impressive charting options, as any decent built-for-Mac app should boast. Family Tree Maker for Mac can branch out onto the web to search for people in your tree—most notably on Ancestry.com when you subscribe to the service, which isn’t cheap but is worth the investment if you’re serious about digging back into your family’s past and you don’t have time to go to the original paper-based or microfiche sources. The inclusion of six months of the Premium Ancestry subscription is invaluable in this context. Family Tree Maker for Mac offers fewer features than Family Tree Maker for Windows. How many? At least 100 if you believe the boasts behind the launch of the latest Windows version – and those 100 are some of the most requested, according to genealogy software forums.Family Tree Maker for Mac is based on the features and functionality of the Family Tree Maker 2010 PC Version, not the latest PC version that boasts far-superior integration with the Ancestry.com service. In the latest PC version, when you find new records you can quickly merge them into your tree. Syncing online and offline trees isn’t possible with Family Tree Maker for Mac, so you have to keep updating on one when you change details on the other. That duplication of effort stops me thinking about using the online and offline products in tandem, which I’d really like to do—but I won’t switch to Windows just for this privilege. This doesn’t make Family Tree Maker for Mac a bad product, and the links with the Ancestry.com service are still valuable. But it does rankle when you know there’s a more sophisticated version existing on another platform. It might be worth waiting for the updated version (according to sources this could come as soon as October) if you’re already happy with one of the alternative Mac family tree programs or indeed if you subscribe to one of the other online genealogical services where Ancestry integration won’t be much of a consideration. If having access to Ancestry.com is in your plans, Family Tree Maker for Mac is definitely the offline/online program for you. When it’s caught up with the Windows version it should prove invaluable. 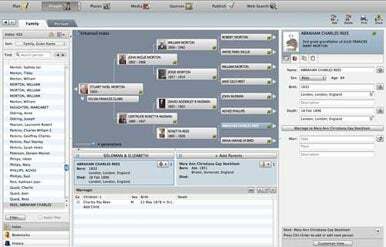 Regardless, Family Tree Maker for Mac is still an excellent genealogical application, boasting a smart user interface with well-laid out features. This story, "Ancestry.com Family Tree Maker for Mac helps track ancestors" was originally published by PC Advisor (UK).